On a cold but beautifully clear day in Reykjavik, Sean and I went on an eating adventure on a Reykjavik food tour. It was the perfect tour for me…a picky eater trying to be a foodie. From the freshest seafood to the best lamb hotdog in the city, this tour has the best of Icelandic food. Our tour guide, Sara, knows everything about everything and we loved her tour. We hope you enjoy the peek at Icelandic food. Oh, and do not be scared to visit Iceland in the winter. It’s beautiful! 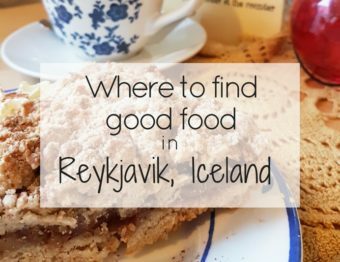 The Reykjavik Food Walk is a must because people are always talking about Icelandic food and yet they really have no idea! On this food tour in Reykjavik, you get a not-boring-at-all history and cultural lesson alongside sampling a cuisine that has probably had you curious for a while. I know I was curious because I didn’t even know what to expect! Take a second and think about what comes to mind when you hear “Icelandic food”– what would that be? 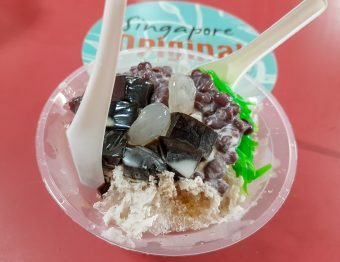 You won’t be eating the infamous fermented shark on this tour, but they can definitely point you in the right direction if that’s what you are looking for. 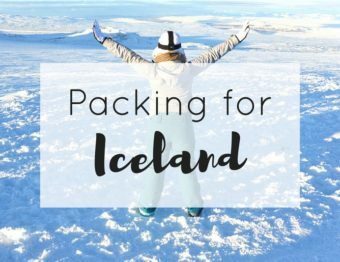 Instead, you’ll be treated to hearty soups, the famous Icelandic hot dog, ice cream made from bread, and meats that may not be so familiar to you but you’ll end up wishing there was more in your life. You’ll have a few more surprises along the way, as well. First up is one of the most traditional bites you can have in Iceland, the meat soup, in a restaurant that has such a wonderful local vibe. This soup can be made is all kinds of ways but typically has lamb and veggies inside. The variations you’ll probably see can be whether these ingredients are also included: potatoes, rutabagas and carrots, leeks, onions, and different herbs. Nothing at all is weird about this dish. It’s just plain good. The local flavor can come in all kinds of forms. 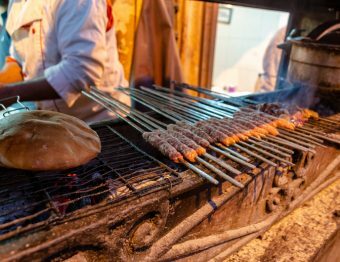 Meat and cheese tend to be a staple in many cultures and this one is no different…though cheese hasn’t always been their thing. Doesn’t matter much because how they make cheese now is delicious and different from other cheese you’ve ever had! Add to that, the meats that make their world go ‘round. These people know how to season their food. We had cured lamb with rosemary, thyme and fennel, smoked goose with raspberry champagne sauce, and beef with paprika and thyme. If your mouth isn’t drooling already, I don’t know what will do it! This is going to blow your mind. Really. When I heard about this dish, I was so confused and intrigued. It’s rye bread ice cream. Did you see that coming? It’s a secret family recipe that will delight you. Isn’t just so pretty, too? Oh, the famous Skyr. It’s kind of a cheese/yogurt kind of food. You can now get this all over the world! Well, at least, we have it in Amsterdam 🙂 I’m pretty sure the U.S. has it, too. Apparently, it was the Icelandic attempt at cheese. Might not have been what they were going for, but now it’s famous! Warm, comforting soup in the winter, there’s nothing better. That’s why we didn’t complain when we got a bowl of seafood soup at a restaurant overlooking the water. Yeah, it was amazing. The rock crab soup with shrimp and spinach has a taste that invites you to take another bite. Then, another. And, another. In case you were wondering, the bread and fabulous butter are another reason to visit. The may have had problems making cheese in the past but we’ve had a couple butters in this city that were unlike anything else! If you thought you’d take any food tour in Reykjavik and not have the famous hotdog, you are seriously mistaken! Did you even go to Reykjavik if you didn’t have the hotdog? No. I say, no you did not. It might be cold, it might be raining or snowing, but this outdoor hotdog stand is a must-do on every.single.list. Get it with everything on it so you get the whole experience. I’m still a picky person, so ketchup-only for me! By the way, it’s not pretty. I want to see a beautiful picture of this place and the hotdogs. Really, I would. But, that’s not why you would go. For the last stop, we popped into a cool-looking restaurant for dessert. It’s a classy place with an apothecary theme and a famous pastry chef. Perfect spot to end the tour! We all got to sit together, enjoy the beautiful (Look at this dish!) dessert, and talk about our favorite parts from the tour. This plate that ALMOST looks too good to eat is chocolate apricot mousse with apple ice cream. Super fresh and not what we were expecting in the winter. Loved it and the creativity behind it. There were so many great parts! The views, the tour guide, the food, the insights into the culture, all of it. We really enjoyed the variety of places and foods. I had no idea all this was in Iceland. All we ever heard about was the fermented shark. Then, we show up and this is what we were fed. Needless to say, we were very happy and very full. If you’re headed to Reykjavik, go ahead and book this tour now. The, pop back here and leave a comment letting us know how you liked it! 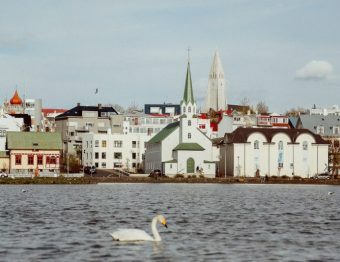 Find other exciting options and tours in and around Reykjavik to make the most of your trip to Iceland! Every food looks so yummy and delicious. I’d love to taste that orange colored dessert. It seems like prepared with ripe mango for the color. Great to know for the first time about Icelandic Food. I’d love to get back to Reykjavik, and I think I’d really enjoy this food tour. Sounds like you get to try a wide range of Icelandic food. I’m super intrigued by the rye bread ice cream. I didn’t know much about the food before I went to Iceland, and I have to say I was pleasantly surprised. Great post – not many people know about the food of Iceland! I am so happy you have been able to experience it! I’m so excited to try all of these! <3 I'm a HUGE ice cream fan so I'll definitely go hunting for the rye bread ice cream. The food looks delicious. I definitely need to take a trip to Iceland! I love food tours and this one seems exceptional, Sean and Jessica. I believe that through food, we get to know a place better. I wouldn’t hesitate for this tour when in Reykjavik which I hope will happen soon. Thanks for whetting my appetite!